I’m so excited to announce The Hip Thruster! I intend on making this unit very popular over time and continuing on my pursuits to help people attain better butts across the world. I believe that in ten years, these will be very common in commercial gyms, athletic training facilities, personal training studios, and Crossfit boxes. I’ve had my Hip Thruster for a couple of months now, and I absolutely love it. Don’t worry, I’m not some overzealous inventor who overvalues his invention. You can just do barbell hip thrusts at the gym along with other great glute exercises to attain an amazing glute workout and achieve excellent results. However, for people like me, who love working their glutes and make the glutes a training priority, it’s such a nifty tool. And one thing this blog has taught me is that there are thousands upon thousands of people out there who are just like me – people who love gluting! After teaching barbell hip thrusts to the world in 2009, I can’t tell you how many emails I’ve received over the past few years from lifters complaining that their benches are too high for hip thrusts, from coaches complaining that they need their benches and racks during training sessions and therefore have trouble employing hip thrusts with their teams, from lifters wondering how they can incorporate bands into their hip thrusts, and from commercial gym-goers wondering where they can hip thrust since their gyms aren’t conducive to hip thrusting. The Hip Thruster is the ultimate piece of exercise equipment for gluteal sculpting. In fact, the hip thrust exercise elicits over double the activation in the gluteus maximus musculature than heavy barbell squats and places greater loading on the hamstrings too, not to mention that it’s easier on the low back. We’ve tested almost every popular glute exercise in existence, and there’s no better way to target the glutes than hip thrusting. What’s more, the hip thrust is a highly stable, easy-to-learn exercise that can be performed comfortably by just about everyone. Simply place the feet on the mat and the mid-back on the pad and start thrusting the hips. As you progress in strength, wrap a band around the hips, use a barbell, or utilize a combination of both barbell and bands once you reach advanced status. The hip thrust can be used by individuals seeking better butts in the comfort of their own living rooms or garages. It can be used by athletes seeking greater speed development, personal trainers training clients out of their studios, Crossfit boxes seeking greater glute training methods, sports teams wanting an edge on their competition, or physical therapists wanting to improve their clients’ functional strength. Since the gluteus maximus is quite possibly the most important and versatile muscle in the human body for increased athleticism and physical fitness, you want to be performing the hip thrust regularly to maximize your performance, not to mention your appearance. Everybody appreciates nicely shaped buttocks! The Hip Thruster is highly durable with no moving parts (except the wheels), so it will stand the test of time. It accommodates taller individuals up to 6’6″ in height as well as shorter individuals as low as 4’11” in height. High quality wheels and a handle allow for easy manipulation and transportation. The bench is set at 16″ which is the optimal hip thrusting height for the majority of individuals. 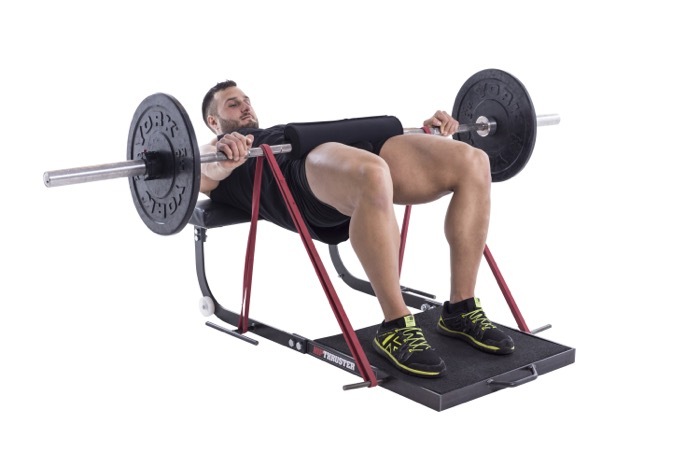 The Hip Thruster eliminates the need to place a bench against a wall or have spotters ensuring that the bench doesn’t slide away from the feet. It’s a standalone unit that can be placed anywhere, including right in the middle of a living room while watching television or in the middle of a commercial gym floor. It saves power rack space in athletic training facilities to be used for other exercises. It can be stored upright against a wall or inside of a closet. Band pegs allow for the hip thrust to be performed against elastic resistance so you can attain an incredible glute workout without the requirements of free weights. Conversely, free weights can be used as well for variety. Bret Contreras, MA, CSCS, and inventor of The Hip Thruster has coined the popular saying, “Abs are made in the kitchen, but glutes are made in the gym.” Well, now you don’t have to go to the gym to train your glutes optimally – you can train them in the comfort of your own home. Band Hip Thrusts are Awesome! I still feel that barbell hip thrusts are superior to band hip thrusts if you could only go with one variation, but I feel that doing both barbell and band hip thrusts is optimal for reasons I’ll explain below. That said, the band-only option is truly incredible. If you have this unit at your home along with resistance bands, I can tell you that you’re apt to perform hip thrusts very frequently. As a matter of fact, if you’re like me and my girlfriend, you will perform them nearly every day. The bands aren’t “intimidating” like free-weights, they don’t require as much warming up or psyching up, and they feel very comfortable. I like to perform a few sets shortly after I wake up as I find that they make my body function better throughout the day, both in my workouts and in my regular acts of daily living. They also don’t kick the crap out of the CNS so they will only complement training and won’t impair subsequent workouts. Serious Burn, Pump, and Metabolic Stress! I wrote about the importance of both mechanical tension and metabolic stress as they pertain to hypertrophy HERE. I can tell you that every person I’ve trained off of the hip thruster when prescribing band hip thrusts, remarked that they’ve never felt so much tension in their glutes before, or that they’ve never felt their glutes activating to such an extent, or that they’ve never felt such a deep burn in their glutes before. This includes 4 bikini competitors, 3 powerlifters, 2 pro athletes, and more. Here is some footage of the old unit in use. I’ve had 2 different 350 lb NFL offensive lineman perform band hip thrusts, and both of them remarked about how comfortable the bands were on their hips and that they loved that they could work their posterior chain so effectively without having to wrap their knees, wear a belt, or take such a heavy beating on the joints. This is an important consideration in training athletes who play contact sports. What athlete wouldn’t benefit from having stronger and more muscular glutes? It’s going to help them run faster, jump higher, cut and turn more quickly, and remain healthier. I think that the hip thruster is absolutely perfect for Crossfit. In fact, I think that Crossfit boxes should each have two or three of them and incorporate them into their WODs. With all the different combinations of bodyweight, barbell, band, barbell plus band, single leg, high rep, low rep, drop sets, pause reps, rest-pause reps, constant-tension reps, and isoholds, you can easily create a different highly effective protocol for each day of the week (or even month for that matter). A Glute WOD, if you will. Crossfitters would love it, as would their glutes! If you want your gym to carry a Hip Thruster, send them this article link and let them know that you think it would be a good addition to the gym. Commercial gyms might be leery of buying resistance bands to accompany the unit because they aren’t traditional and they could get stolen, but I think every gym should have at least one Hip Thruster to have a dedicated space to perform barbell hip thrusts. Bands would be icing on the cake. This way, those performing hip thrusts would feel more comfortable performing them, and those not performing hip thrusts would appreciate having more benches, bars, and racks available for use. If you have proper tools you can put it together in 5 minutes. It’s very simple! Is it Better than Other Pieces of Posterior Chain Equipment for Glutes? As I mentioned in THIS article, the glute ham raise is a hamstring exercise, not a glute exercise. Straight leg hip extension exercises such as the back extension, 45 degree hyper, and reverse hyper, do a great job of targeting the entire posterior chain, whereas hip thrusts keep the knees bent and the hamstrings shortened so the hammies do less and the glutes do more. Hip thrusts are more pure of a glute exercise. You will find that when you factor in shipping costs, The Hip Thruster costs much less than good quality reverse hypers, back raises, and ghd’s. Last, I’ve seen many gyms carry ghd’s and reverse hypers that collect dust and never get used (which blows my mind but it is what it is). If you teach the female membership how to properly perform hip thrusts and use the unit, The Hip Thruster will likely be the most favorite piece of equipment. What’s Better: Barbell Hip Thrusts or Band Hip Thrusts? This is a great question and one that I don’t know the answer to, but I’ll tell you what I do know. Barbell hip thrusts have a very steady torque-angle curve so they work the glutes fairly evenly through a full range of motion. However, band hip thrusts have an increasing torque-angle curve so they work the glutes hardest at end-range hip extension but not so much at flexed-range hip extension. Due to the fact that the brain delivers more neural drive to the gluteus maximus at end-range hip extension (lock-out) compared to flexed-range hip extension (starting position) and the fact that the band hip thrust emphasizes the lock-out position, the band hip thrust elicits greater mean and peak glute activation than the barbell hip thrust. Bands are much more comfortable on the hips and, but sometimes the tension is so high in the glutes with bands that it requires some getting accustomed to as you need good lumbopelvic posture (the same applies to the barbell too, but even more so with bands). The bands have a smoother “feel” to them, but if you’ve been doing barbell hip thrusts for quite some time you will likely feel that the initial range is missing tension because you’re used to the movement being harder down low. If I had to hypothesize regarding which variation led to greater gluteal hypertrophy over time, I think I’d go with the barbell just because I’ve seen 3 different published papers in the past two years on full ROM movements versus partials on hypertrophy and the full ROM movements always come out on top. However, the band hip thrust is different in that although it focuses the tension on a smaller ROM, it also increases peak tension and activation on the glutes, which isn’t always true of partials. Moreover, you can get an even bigger pump and burn and thereby elicit greater metabolic stress with the bands than you can using a barbell. On the other hand, one thing I love about the barbell is that it’s so conducive to progressive overload – people are aware of the loads they’re using and seek to go heavier over time. So don’t stop barbell hip thrusting, just start also incorporating band hip thrusts. Strength training is not black & white and we can utilize a variety of methods in our workouts. One can simply alternate between band and barbell hip thrusts each training day to reap the benefits of both worlds and maximize progress. I chose to go with Sorinex to manufacture The Hip Thruster for a few reasons. First, I have a ton of respect for Richard (dad) and Bert (son) Sorin. They are true innovators and have done the strength training industry a major service over the past couple of decades. Visit their showroom in South Carolina and you’ll know what I mean. Second, they’re true gentlemen. I have met their families and friends, along with much of the staff, and I trust and support them. And third, since they’ve been in the game for 30 years, I trust them to make a unit that is both durable and efficient. I’m proud to be associated with Sorinex. As you can see, I believe that The Hip Thruster is the ultimate glute building machine. If you’re trying to maximize your glute size, I believe that you should pick one up and start hip thrusting with high frequency (as in 5-7 days per week). Of course you can get an amazing hip thrust workout using a standard bench or some aerobics steps. You can probably even rig something up in a power rack to enable the performance of band hip thrusts. However, if you plan on making hip thrusts a major part of your routine for many years to come, or you own a facility and want to give your clients the best workouts possible, or you wish to perform hip thrusts in your home or garage, then I highly recommend picking up a Hip Thruster. Click HERE to order a unit now. The post Introducing The Hip Thruster! appeared first on Bret Contreras.